As a working mom and a blogger, I feel like I have no time. In reality there are tons of tiny pockets of time I can squeeze things into. In fact I do a lot of my blogging in those tiny pockets of time. (By blogging I also mean checking my social media, responding to comments, and just jotting down quick ideas for a new post.) So I’ve decided to use a few more of those tiny pockets of time and start doing more exercise. If, like me, you need some motivation to just get moving more in your day, put on some music and dance around while you’re doing less fun things like loading the dishwasher or folding laundry. Just upping your amount of movement burns extra calories. I’ve convinced myself that singing along at the top of my voice must burn extra calories as well – for when I’m doing some other chores (like sweeping) that aren’t so great to add dancing to. I’ve been taking an adult ballet class for a little over a year now. I love it and if I don’t show up I tend to hear about it the next time I’m at the dance studio (Kingston School of Dance) for one of my girls dance lessons. I’ve also Facebook friend-ed some of the regular ladies who attend so there’s that camaraderie and the push to show up so I don’t get people asking me if I’m okay! This also doubles as some kid-free “me time” where I socialize with other people outside of my own home. I feel like this is the single best thing I’ve decided to do for myself since my kids were born. Well, that and maybe blogging. Walk and take the stairs. I know this is self explanatory, but just walk more. When I’m home without the kids and the weather is okay I try to take at least a half hour walk. It’s not a lot, as I only fit in one walk a week in the spring/summer/fall. I wuss out in the winter because: the sidewalks are terrible; the wind is too cold; it’s snowing/blowing/cold; or any other winter weather related excuse. But to make up for that in the winter I park my car far from the door of whatever store I’ve had to venture out to. It just adds a few minutes of walking (if it’s a big parking lot) but it all adds up over the day. (Bonus – I’m far away from other cars in a potentially slippery parking lot!) I’m also a big advocate of ‘take the stairs’! Unless you’re carrying something heavy, or you’re going up 5 or more floors, take those stairs. Do a few strength training moves in those tiny spare moments. Tell others you’re trying to fit more exercise into your life. This Christmas I got some really thoughtful gifts from my family. A waist belt that will fit my phone, some keys and money for when I go for my walks, and a muscle roller for those weeks where ballet class works me just a little too hard. I would never have received these useful items if others didn’t know I’m trying to get more exercise in my life! Plus you never know who out there is looking for a walking buddy, or who has other great tips and ideas to help you get your exercise on. So share your goals – that also keeps you motivated! 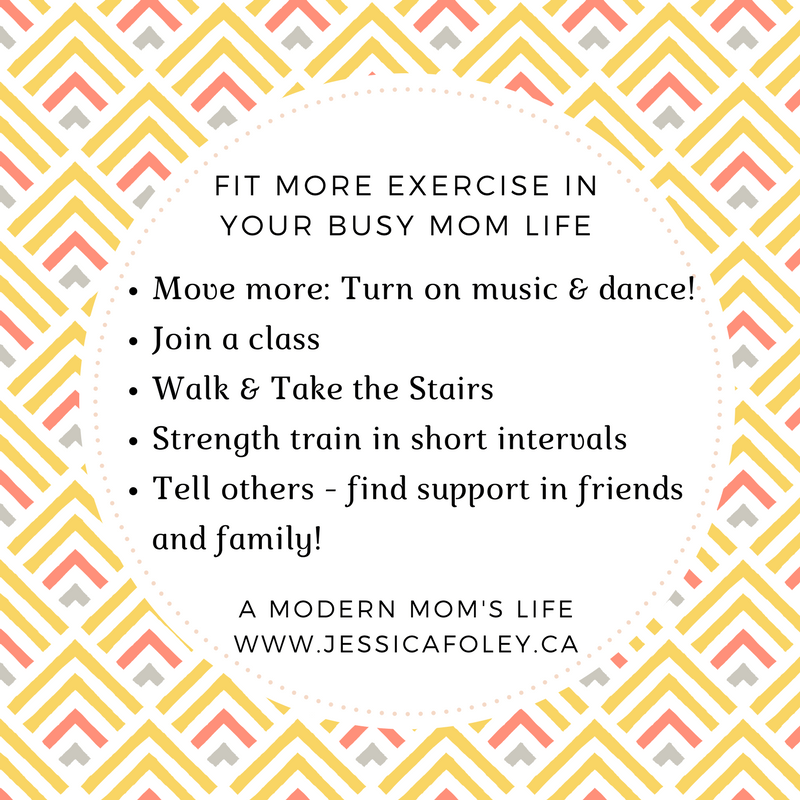 So there you have it – a few things I do in my life to help me with my life goal of doing more exercise. Let me know if you use any of these tips in your life. Or if you have any ‘squeeze in some exercise’ tips for me to try, please share them! Hi Jess, it is so easy to sit back and make excuses not to exercise, but you’ve set out a good way of increasing the amount of exercise done without it being a huge effort. I hate driving in town so always tend to park away for the business and walk in. I’ve now found a brilliant place to park up a steep hill, which is a brilliant workout…. I’m glad to read you are still enjoying your dance classes, I remember reading your post when you first went back last year. Dance is an excellent way to keep fit. Thanks for the share Elizabeth! I never liked gym class. My favourite exercise is a walk with my headphones in. It’s escapism for me. Once the sidewalks clear from our last bout of ice rain I plan to get back into more walking. Winter always helps me lose my motivation! Routine is key – I need to get back to one! Thanks for your comment! With four small kids I never sit down. I even blog standing in the kitchen – I run on the treadmill daily and eat carefully. Why am I not like three pounds? It’s easy to fit in those reps, but I’ll be honest – I often don’t. I’m trying hard to get this “working out” thing into a habit, but I’m not there yet. Good luck to you Jeanette! Let me know which posts you enjoy on my blog, and thanks for stopping by! Good for you! Baby steps and lifestyle changes are really the only way to get healthy these days. I hope you can get back to it! Happy to help. I still struggle with this but I am working on trying to be more active! Dance is so much fun. Thanks for stopping by to comment! Even though I wrote that post I still don’t really follow my own advice! Thanks for the comment. Really great tips!! I have started only taking the stairs and I feel much better for it. Also dancing around while folding laundry is my fave, my son who is just starting to learn how to shake his bum is so cute hell dance with me as well, definitely makes for a better laundry folding session. I’m going to take your advice and start doing more strengthening exercises! Thanks for sharing with #stayclassymama! Have you really? That’s awesome! I’d love to hear what you think of it! While the tips are easy, keeping up with them routinely I’m still finding difficult. Thanks for the comment Heather! These are some really great ideas and I’m definitely learning to fit in more stuff in those tiny spare moments. I work from home twice a week and instead of chilling on my lunch break I’ve started going for a run. I like the idea of fitting in the odd bit of strength training too. I need to get on that and start lifting soup cans or something. Thanks for linking up to #eatsleepblogrt. Hope you can join again next week. I’m trying hard to get more walks into my weeks. It’s not going too well right now, but once the weather finally warms up a bit it’ll be easier for me. And I can’t find my small set of weights! I am home with an infant. Now instead of trying to fit in exercise during naps, which didn’t work so well, I am now following cardio dance videos while babywearing. This is more fun and less stressful. Hoping to stay consistent! Thanks for the inspiration! When my kids napped (which for my first was NEVER) I used to think I’d sneak in a workout or something. That never worked for me. Now it’s easier for me as my kids are older and sometimes they like to hang out while I stretch or whatever. Babywearing is a great strategy for helping with exercise. Even just taking a walk around the neighbourhood with baby strapped on works great for a workout! Great tips for getting a bit more exercise into our lives. I’m trying to get back into doing some exercise but some days it can be a challenge. One small step I have taken is doing lunges or squats while I cook. I think it’s amazing how much you can fit into those little moments in the day. I totally hear you about it being a challenge to find the time. I hope you find success with the small moments!